​Natalie Au Yeung is a first year Ph.D. student specializing in Human Development in Context (HDiC). She is interested in how individual differences, such as pressure, executive functions, self-efficacy, and bilingualism, would affect student engagement in higher order thinking in a math learning context. Natalie graduated from the Chinese University of Hong Kong as a psychology major. She also earned her MA in Social Sciences with a concentration in Psychology and Comparative Human Development from the University of Chicago. 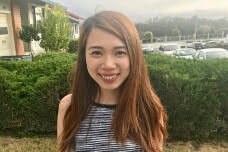 Prior to her studies in the United States, she worked as an inspector in the Education Bureau of Hong Kong and a high school math teacher in Hong Kong for five years. These experiences have formed her interests in her current interdisciplinary research.